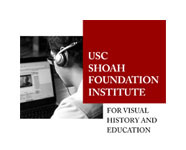 The USC Shoah Foundation Institute's Visual History Archive (VHA) is the world's largest collection of testimonies from survivors of the Holocaust. The digitized Archive contains nearly 52,000 testimonies in 32 languages (about half in English) and from 56 countries. The Institute interviewed Jewish survivors, homosexual survivors, Jehovah’s Witness survivors, liberators and liberation witnesses, political prisoners, rescuers and aid providers, Roma and Sinti (Gypsy), survivors of eugenics policies, and war crimes trials participants. NOTE: The VHA works best with Internet Explorer. VHA is also compatible with Firefox (PC) and Safari (Mac). However, you will need to install some extra software for Firefox and Mac compatibility.